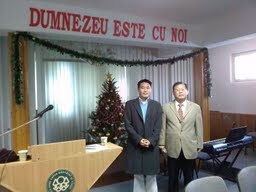 From 10 - 12, Dec. 30, a worship service took place at the Young Lee's Missionary Training Center. The worship consisted of prayers, hymns, offering, Pastor Young Lee's words of encouratement and admonition, songs of praise such as a family coming out and serving a special music program. Another couple served a special song. A missionary Sandu came out and served a brief message. The next program was myself coming out and making a special report on God's work throgh the UBF ministry. Pastor Young Lee's wife Esther quietly served all the attendants with prayers, serving food, greetings, etc. 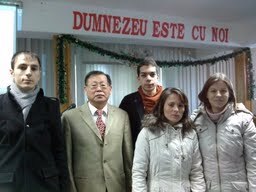 Bucharest UBF members (John J. Chung and his wife Monica, Alexandru (master 1. agricultural consulting), Doru (landscaping 4)and Andreea (political science 2) at bucharest univ. attended the worship. After my presentation, Pastor Young Lee hurried me to go to another church for another presentation, whereas Bucharest UBF coworkers remained at the church and kept company with the congregation for post worship fellowship. The church in Codlea branched out to Sacele which is another sattelite city of Brasvo. There from 6:30 - 7:30 p.m. I also shared a special testimony on God's work through UBF worldwide. About one hundred people were gathered. Thereafter the Gabriel family invited us to a dinner fellowship. The fellowship lasted from 7:30 p.m. till close to midnight. 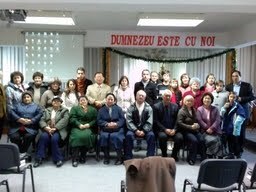 - Invite to and host a luncheon fellowship all Korean missionaries operating in Romania (including our present UBF members as well as ex-UBF director. I don't know how many will come. - Head for the airport to go to Tanzania for the African Directors' Conf. 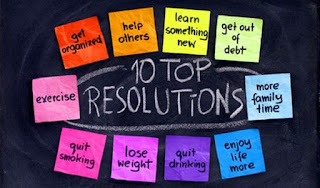 Making a new year's plan involves making resolutions to do this or not to do that. It also concerns one to be a better person or to be in the better position or state of being. But when you think about it, as Albert Einstein said, when we do the same thing over and over again, and still expect different results, we only prove ourselves as 'insane'. So what is in demand is to be 'renewed', for renewal is different from improvement. Inasmuch as what He has accomplished on you is already perfect, what is needed is to be renewed at a time called "NOW". This is what the RTS (Real Time Synchronization) is all about. Lord, please help me not to go insane again, next year, Please! Los Angeles UBF will have a Christmas worship service at Cal Poly Pomona on Dec 23. Men! Year 2012 is almost gone! Only 12 days are left! "And things did not change that much. What happened to my Year 2012 New Year's resolution?!" (Or did you make one?") So you say, "Next year things are going to be different!" But wait a sec. Before you and I consider making a plan let us think about what Albert Einstein said. Abneli - God is gracious! Shepherds of Kenya UBF played this song at the Wedding Hall, so I copied it. Title of the song is Abneli which apparently means "God is gracious." 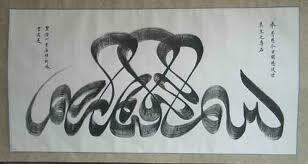 RTS (Real Time Synchronization) between the Father and his children is in his will in and from the beginning. In fact it is embedded in who he is and who we are. He created Adam by breathing into his nostril the breath of life. He used dirt (as the raw material) which also came from Him. This means we are out of Him. In as much as we are out of him, he wants us to be at one with him, real time. 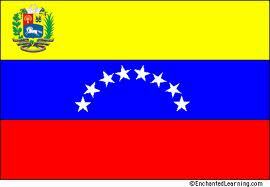 On Dec. 12, 2012, Missionary Juan Seo of Venezuela sent me an email sharing God's work there. - Juan Seo got an admission letter from the Fuller Seminary located in Pasadena, CA, for an advanced study (MDIV). The class begins September, 2013. - Shepherd Gustavo Prato is the succeeding Director for Venezuela UBF. - Last Summer 176 members attended the Summer Bible Conference. 안녕하세요? 건강은 어떠신지요? 하나님께서 선교사님께 필요한 건강 주셔서 계속하여 세계선교역사를 능히 섬기게 하시길 기도합니다. Fuller 신학교로부터 연락이 왔는데 오는 2013년 9월에 시작되는 가을 학기에 입학하도록 허가를 받았습니다. 제가 공부할 수 있는 길을 열어주신 하나님께 감사드리고 기도해 주시고 또 필요한 도움을 주신 선교사님께 감사드립니다. 지난 1년 이상을 베네수엘라 역사가 현지 목자들을 중심으로 이루어지도록 준비해 왔습니다. 현재 Gustavo Prato 목자를 중심으로 현지 리더들 가운데 합심 동역하는 역사가 일어나고 있습니다. 지난 여름수양회를 Gustavo Prato 목자의 주도하에 섬겼는데 176명이 참석하는 은혜로운 역사가 있었습니다. 그리고 지난 주일에 가진 성탄예배에는 330여명이 참석했습니다. 제가 미국으로 가기 전까지 계승 역사를 잘 준비하여 저희 가정이 없더라도 베네수엘라 역사가 영육간에 더욱 성장할 수 있도록 기도 부탁 드립니다. LA 를 방문하게 될 때 찾아 뵙고 많은 조언 받을 수 있기를 기도합니다. Lately an increasing number of people are using Kakao Talk. Using this application you can send a newsletter or a video file. To communicate with my wife, I got installed Kakao Talk on her Iphone a while ago. But after coming back from my trip overseas I sent a cool picture to my wife, but she was not able to open it. Upon checking her mobile phone I realized that the software for the Kakao Talk was outdated, so I had to delete the application, and re-install the most recent version. Then it started working. Between two human beings (my wife and me) conversations can take place via direct face to face talk, or remote talk via mobile device using such applications as Kakao Talk. 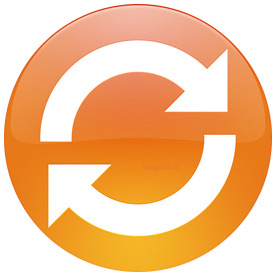 In case you use the gadgets like Apple products like Iphone, Ipad, or Mac Pro, you are to get the programs 'synchronized'. What about the communication between Jesus Christ and me? The same thing - synchronization is needed, and I need to be in sync with him real time. 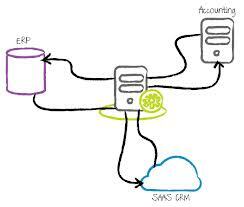 Communication requires two parties keeping the lines open. So when you call, Jesus answers, and when Jesus calls you also ought to answer. When you call, He will always. But what about the other way around? And communications are for the synching, and are we in sync with Jesus all the time and in real time? We held the first summer Bible Conference in Juba, Southern Sudan with 20 students. In this conference we studied three Bible studies in three groups based on Gospel Luke. The opening address was given by shepherd Padiet Deng, a briefing of our ministry of who we are, why and how we study the Bible, and our purpose of studying the words of God to the university students and raising them to become Jesus’ disciples. The first main message was given by shepherdess Rose Peter, from the Malakal Chapter. Based on Luke 8: 1-21 ” The Parable of the Sower,” the message was full of grace and power that it challenged all of us to change our hearts to be like good soil which can produce fruits of the Holy Spirit. We confess that we are like rocky and thorny soils. We all accepted to be changed by Jesus’ blood to be good soils, which can produce the fruit of the Holy Spirit and to become Heavenly Children. In the morning of the second day, shepherd Saeed Moses delivered morning devotion on Luke 9:18-27 “The Christ of God”. He reminded us about the Eastern and Northern African Conference that we should confess to Jesus in all our life as our Christ, who died instead of us to give us salvation from sin, and hope for kingdom of God. It was the first time for him to deliver a message but with Jesus’ grace, he delivered it well. We continued our conference on Sunday Worship Services, when shepherd Elia Peter delivered the last Bible study on Luke 9: 1-17 “You Give Them Something to Eat.” We have learned how to have the spirit of responsibility and shepherd’s heart both in our mission field and in our life as Jesus disciples. We are suffering because of the lack of responsibility in our nation that no one can change and teach about. Only Jesus is the way in solving all humanity’s issue. The most important things to do are writing spiritual testimony and sharing all attendants’ testimonies who have written them. Based on the two Bible studies, most of us confessed of not producing the fruit of spirit, being controlled by the fear of devil, and not listening to Jesus’ words. So we prayed and asked Jesus to forgive us and start a new decision of faith to live and trust in him alone. In this conference we raised candidate Gorge Mario to a shepherd. He was one of our disciples in Khartoum, and when we started our ministry here in Juba, he joined us. He is happy to be a shepherd. Actually he is taking care of his two sisters with the word of God. His testimony was taken from Mathew 6: 33, “seek first his kingdom and righteousness and all this thing will be add to you” he emphasized to seek God with all his heart and mind by seeking for sheep and feeding them. He was praying to be a good shepherd and excellent Bible teacher. May our Lord Jesus help him and raise him to be a good shepherd and Bible teacher. 1. A Permanent place for study and Sunday worship services. 2. Raise 12 disciple of Jesus with strong determination by the end of 2013. 3. Shepherd Elia Peter, Saeed Moses to be very strong shepherds in the future. 4. Our Sunday worship to be 15 in attendants and have weekly Bible study with 20 students. 5. 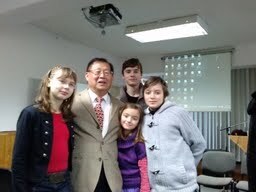 My family to join me by the beginning of New Year.